Yom HaShoah, also recognized as Holocaust Remembrance Day, occurs on the 27th of Nisan (a week after the seventh day of Passover and a week before Yom Hazikaron (Memorial Day for Israel’s fallen soldiers). This is a memorial day for all those who died in the Holocaust. On this day in Israel, sirens go off to commemorate Holocaust remembrance. Every Israeli man, woman, and child will immediately stop what he or she is doing to pay silent tribute for two whole minutes. Those who are driving, pull over and sit silently in their cars—all traffic comes to a stop. Imagine the sight of entire highways at a standstill to remember the lives that were so brutally cut short by the greatest evil the world has ever known. Would you take two minutes today to remember the Holocaust as well? Holocaust Survivors are living below the poverty line in Israel! More than 1.6 million Jewish people in Israel live in poverty and do not have enough to eat. Most are recent immigrants from the former Soviet Union. 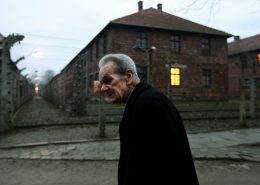 Many are Holocaust survivors who are living out their days in the Holy Land. We provide food for as many of these precious people as we can! Yom HaShoah ve-HaGevurah literally translates as the day of (remembrance of) the Holocaust and the Heroism. This day was set aside on April 12th, 1951 by Israel’s parliament, and the observance of this day became law on August 19th, 1953. Yom HaShoah takes place on the 27th of the Hebrew month of Nisan, to fall between the week after the end of Passover and a week before Yom HaZikaron, Israel’s Memorial day for fallen soldiers. This also corresponds with the end of WWII and the liberation of the Nazi death camps in the April of 1945. This year Yom HaShoah falls on Sunday, April 24.
International Holocaust Remembrance day is on January 27th every year, which is also Holocaust Memorial day in the United Kingdom. How can I talk to my Jewish friends about the Holocaust? Think about how you would speak to a friend who has tragically lost a loved one. In most cases, your friend doesn’t want to hear an explanation or cheery verses from the Bible. Instead, they want to know you care. You can do this by showing solidarity with the Jewish people—participating in a commemorative event for Yom HaShoah, taking a public stance on social media or otherwise, and taking time out of your day to remember the lives so tragically taken. How can I help those who survived? Great question! Many Holocaust survivors in Israel are struggling to make ends meet. They receive a small pension from the Israeli government, and since they are elderly and not knowledgeable in Hebrew language, they cannot work. Many also struggle with basic needs, like getting to the doctor’s office, grocery shopping, and home repairs and companionship. But thank God, we have a team in Israel that helps meet these needs!